No. 607 (County of Durham) Squadron is an auxiliary squadron of the Royal Air Force. It was formed in 1930 as a bomber unit in the Auxiliary Air Force and changed in 1936 to the fighter role. It fought in that role during the Second World War in Europe and Asia. After the war, the squadron reformed as a fighter unit of the Royal Auxiliary Air Force, disbanding with all the other flying units of the RAuxAF on 10 March 1957. It reformed on 5 January 2015, as a General Service Support Squadron (GSS). No. 607 Squadron was formed on 17 March 1930 at the then new airfield of RAF Usworth, County Durham as a day bomber unit of the Auxiliary Air Force (AuxAF). They became operational in the summer of 1933, having received their first aircraft in December 1932, flying Westland Wapitis. First commanding officer was Walter Leslie Runciman (later the 2nd Viscount Runciman of Doxford). In September 1936 the squadron was re-equipped with Hawker Demons and the squadron was told that the role of the squadron was changed into that of a fighter squadron. For that role it later received Gloster Gladiators, which arrived in December 1938. Hawker Hurricane I operated by 607 Squadron in 1940 and preserved postwar in period marks including the unit's AF code letters. Still equipped with Gladiators, the squadron was deployed to France as the Air Component of the British Expeditionary Force in November 1939. During the Battle of France, the squadron operated from various locations, including Saint-Inglevert. In March 1940, the squadron was re-equipped with Hawker Hurricanes. Following the British withdrawal, the squadron returned to the United Kingdom and served throughout the Battle of Britain. In October 1941, the squadron moved to RAF Manston and remained there until 1942. During 1942, the squadron was transported to India. There, it joined No. 166 Wing RAF on 25 May 1942. In September 1943, the squadron's Hurricanes were replaced with Supermarine Spitfires. This change in machine, made the squadron the first unit in South East Asia Command to operate such aircraft. 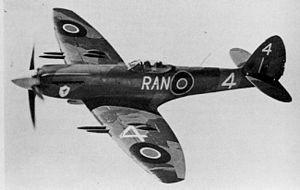 It re-equipped with the Spitfire Mk.VIII in March 1944, and flew these until disbanding on 19 August 1945 at Mingaladon, Burma. On 10 May 1946, No. 607 Squadron reformed at RAF Ouston as a day fighter squadron of the Royal Auxiliary Air Force. After flying Spitfire F.14 and F.22s for five years, it converted to De Havilland Vampires. These were flown until February 1957 when, along with all the other flying units of the RAuxAF, it was disbanded on 10 March 1957. Re-formed 5 January 2015, the squadron is now a General Service Support Squadron (GSS) and operates from RAF Leeming in North Yorkshire. The squadron has an established strength of almost 120 staff and has won awards for its recruitment and retention abilities. 12 August 1939 24 August 1939 RAF Abbotsinch, Renfrewshire, Scotland Annual Summer Camp only. ^ a b Halley 1988, p. 423. ^ Bowyer and Rawlings 1979, p. 16. ^ Bowyer and Rawlings 1979, p. 66. ^ a b c Halley 1988, p. 424. ^ "RAF - 607 (Country of Durham)Reserves". Retrieved 18 December 2015. ^ "RAF Reservist Squadron welcomes first recruits". Retrieved 18 December 2015. ^ a b "Newly Reformed Sqn Remembers Its Past". www.raf.mod.uk. Retrieved 12 December 2017. ^ a b Rawlings 1978, p. 490. ^ Rawlings 1978, pp. 490–491. ^ a b Jefford 2001, p. 100. ^ Jefford 2001, pp. 270–271. ^ Rawlings 1978, p. 491. ^ Hunt 1972, pp. 163–181. Dixon, Robert. A Gathering Of Eagles London: PublishAmerica, 2004. ISBN 1-4137-3498-7. Dixon, Robert. 607 Squadron: A Shade Of Blue. Stroud, Gloucestershire: The History Press, 2008. ISBN 978-0-7524-4531-1. Dixon Robert. 'Men Of The North A Few Of the Few' Wolf's Nick Publishing, 2011. ISBN 978-1-4664-4683-0. Jefford, C.G., Wing Commander MBE, BA, RAF(Retd). RAF Squadrons, a Comprehensive Record of the Movement and Equipment of all RAF Squadrons and their Antecedents since 1912. Shrewsbury, Shropshire, UK: Airlife Publishing Ltd., 1998 (second edition 2001). ISBN 1-84037-141-2. Wikimedia Commons has media related to No. 607 Squadron RAF. The Official RAF Website about 607 sqn.